This dish is a wonderful way to showcase the fall root vegetables. Whenever I make this dish, it makes me feel like I’ve created the taste of the leaves changing. If you cannot find delicata squash,replace it with a peeled and diced butternut squash. You can also use roasted pumpkin, which would have to be roasted separately and cut into similar sized pieces. After all of the vegetables are chopped, toss with olive oil and herbs. Place on a large baking dish where the vegetables can all be in one, single layer. Season to taste with salt and pepper and spread evenly in the pan. Bake for 20-25 minutes, or until all vegetables are tender. 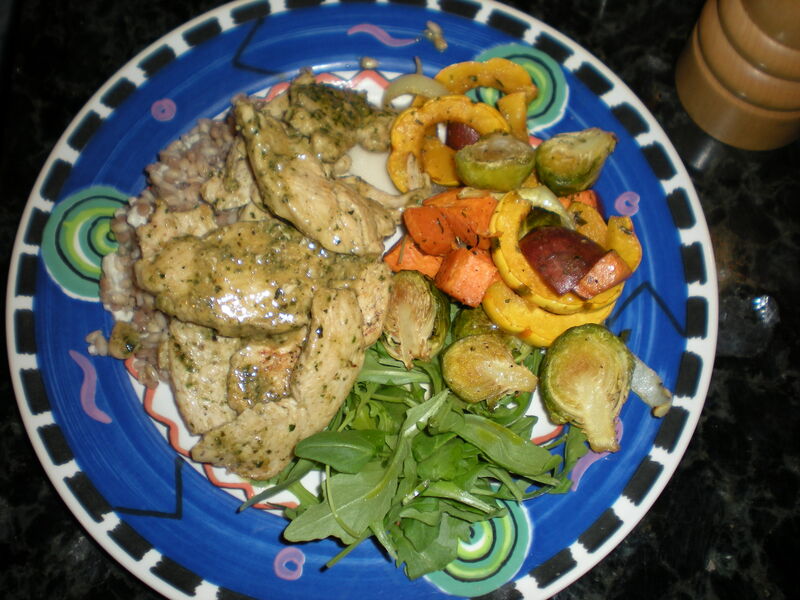 Shown above served with pesto chicken and arugula salad.